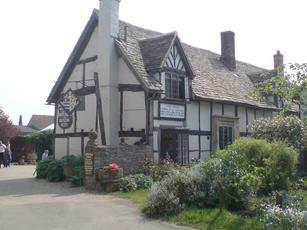 If you love historic, traditional, real pubs this is a must visit venue. Absolutely stunning. A national treasure. Nice selection of ales as well. After a look around I was delighted to sit outside and enjoy the last (I think) musician of their weekend blues festival. Probably way back in the mists of time another reviewer has mentioned that this pub is owned by the National Trust and with little reflection it is obvious that this pub clearly benefits.The priority is the upkeep of the beautiful building and its contents ,lots of pewter plate and mugs I recall.Much to my relief you pay no admission fee and cross the threshold for just the cost of a pint.If this isn't the best pub on BITE then it must be a pub i've never been to. Really busy on this Saturday lunchtime but excellent service for beers and food. There were 5 trad beers and 3 trad ciders on and we had beers from local(ish) breweries, Salopian and Wye Valley. The building is rambling and gorgeous. Well worth a visit to it and the village. Excellent pub but very busy on a late Sunday lunchtime. Good sandwiches with interesting range of fillings. Beers good but a local light bitter would have been preferable to one from Lees in Manchester. A real gem of a pub, kept in a very old fashioned way. Some fine pieces of traditional furniture. Beer was well kept and a good variety.